Why Is My Cocker Spaniel So Growly? Cocker Spaniel Growling? Not This One! 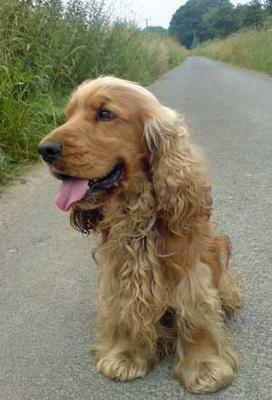 I got my cocker spaniel from a breeder at 5 months of age - he's now 18 months old. Within a few days he began to dominate the other (foster) dog in the house, jumping on him and pinning him down growling all the while. Thankfully, I eventually found a good home for the foster dog. This fall I got another puppy when my ex's and my last dog together died in my arms. I had had the cocker for a year and he was pretty calm around me. The new puppy was his instant target. While I protected the puppy when necessary, I let the cocker dominate since it was his place as first dog. I did work on making them both go to their places, and we have done puppy obedience training. But now the cocker won't let the 8 month old puppy anywhere near me except by sometimes moving to another place in the family room so she can be with me. He has started to growl at the cats when they come to sit with me. He even growls if I disturb his sleep although he stops immediately when he sees it is me. But I don't like this personality. I am thinking about giving him up because he is such a meany. I feel sad about it, but why is he so unpleasant? What can I do, if anything, to help him share me with others? Comments for Why Is My Cocker Spaniel So Growly? I'm so sorry you had to give your puppy back to the breeder - that's such a shame. However, there are some times when it's the only solution. I think if you'd kept it any longer, there would perhaps have been some trouble - serious trouble. When our dogs behave like that - it sounds like jealousy/protecting you - things can get out of hand if not handled professionally. Personally, I think you did the right thing. I had to give the puppy back to the breeder when she was large because she turned it around and began to beat up the cocker and since she weighed 5 times his weight she was a real potential injury.